William Allingham first came to Innovate Product Design with his idea after his trailer slowed down and often stopped his quad bike. 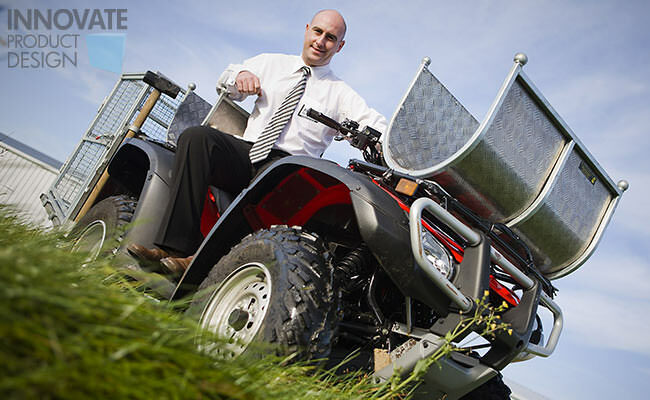 He William’s invention was for a crate which could be fitted directly onto his quad bike and he came to Innovate looking for help with the patent, design and assistance then in taking the product to market. The Innovate SolutionWilliam understood the need for clarity regarding existing intellectual property and before working on the visualization of the product used Innovate to perform a thorough patent search. Once the results from this came through and the potential for the project was confirmed, William sat down with Innovate’s product design team and engineers to look to develop the idea from William’s sketch into something that he could patent and then commercialize. The ResultsSince the Quadcrate product launched in 2009, the product has won a number of awards including the Eircom Young Entrepreneur of the Year, Eircom Best Rural Business of the Year, as well as featuring in the Smarta 100 list of top new businesses and being a finalist in the Shell Livewire Young Entrepreneur of the Year Awards.